Indian grapplers Sushil Kumar (60kg) and Sujit Mann (74kg) crashed out of competition without putting even a semblance of a fight to signal an abrupt end to the country’s lukewarm challenge in the Olympic Games here today. Revealing that she was tired and feeling giddy during the event, Indian star long jumper Anju Bobby George, who set up a new national record but finished outside the medal list at the 28th Olympics here last night, assured that her best was yet to come. Argentina won their first Olympic gold medal in 52 years in the football final on Saturday, while the US women's basketballers atoned for their men's failure by storming to victory. China celebrated a stunning double gold athletic triumph at the Athens Olympics with Liu Xiang equalling a world record in the men's 110m hurdles and Xing Huina winning the women's 10,000 metres. 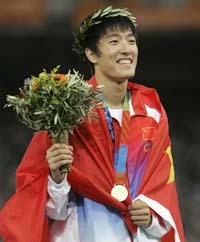 Liu equalled Colin Jackson's 11-year record of 12.91 seconds in storming to the title and was followed by Xing's triumph. Russia underlined their superiority in rhythmic gymnastics by winning the group gold medal with an alluring synchronised performance at the Olympics today. The defending champions easily outclassed their challengers with their two dramatic routines to earn 51.100, an impressive 1.65 points ahead of second-placed Italy. Hicham El Guerrouj completed a historic Olympic 1,500-5,000m double today after a battle royal with Kenenisa Bekele. The Moroccan emulated the achievement of Paavo Nurmi in 1924 as he won the 5,000m in one of the greatest head-to-heads of the Athens games. In a physically brutal encounter, the women of Ukraine outmuscled world champions France to take the handball bronze medal with a 21-18 win at the Athens Olympics today. The Ukrainians, making their first appearance at the Olympics, were dogged in their refusal to allow the French any space, cutting down their shooting chances. Thailand’s Manus Boonjumnong ruined Cuba’s plans to win seven boxing gold medals when he outpointed Yudel Johnson in the light welterweight final of the Olympic tournament today. British teenage boxing sensation Amir Khan believes he can go all the way to gold, even if it takes a knockout, after punching through to the Olympic lightweight final. The much-hyped closing ceremony will make “all of us cry,” said Gianna Angelopoulos, President of the Athens Olympics Organising Committee (ATHOC). It will be a full moon night. Come August 30 and more than 80,000 athletes, officials, media personnel and others would be saying goodbye to Athens, the ancient birth place of the Olympics. To avoid over crowding and departure rush, the airport authorities have cautioned the passengers against reaching the airport more than three hours in advance of their scheduled flight. TEHRAN: Iran’s official sporting body has awarded $ 120,000 to its world judo champion Arash Miresmaeili for refusing to fight an Israeli during the Athens Olympics, a newspaper report said on Saturday. Pakistan let world champions Australia off the hook as they messed up their chase of a modest total and went down by 17 runs in the tri-nation cricket series final here today. Kumar Sangakkara and Avishka Gunawardene slammed impressive half-centuries to help an under-strength Sri Lanka crush South Africa by seven wickets in the fourth one-day international here today. Amsterdam, August 28 The Indian cricket team left the Dutch Capital for England a day ahead of schedule today, wanting to get better practice ahead of its three-match Natwest Challenge series against the home side and the ICC Champions Trophy. Arush Bhandari of Spring Dales School, New Delhi, today won gold medals in the under-16 boys 200m butterfly and 200m backstroke on the third day of the CBSE North Zone (I and II) schools swimming meet at Nehru Stadium. World number four Sushil Kumar lost to Cuba’s Pan-American champion Yandro Miguel Quintana 0-3 and was eliminated from the medal hunt. He has an inconsequential bout in hand against Ivan Djorev of Bulgaria later in the evening at the Ano Liossia Olympic Hall. Djorev has already lost 0-3 to Quintana who, thus, advanced to the next round as the top grappler from Pool ‘C’. Mann, ranked eighth in the world, lost both his bouts to bow out of the competition. The 25-year-old lost to Japan’s Kuhiniko Obata 0-8 in his first bout before going down against Cuba’s Ivan Fundora 0-6. Sushil was totally at sea against Quintana who notched two points in the first minute and gained another in the next to take firm control of the proceedings. The 21-year-old Indian, who became defensive thereafter, succeeded in not conceding any more points before eventually losing the bout 0-3. Mann appeared lacklustre against Japan’s Obata, who was placed third behind the Indian silver medallist in the Asian Championships early this year at Tehran. He was outclassed thoroughly by the Japanese who picked up points quite easily right from the start. The 24-year-old Obata scored his first point in the second minute and increased the lead by scoring twice in the third minute. Mann got trapped by his rival on the mat to concede two more points and a 0-4 lead at the end of the first session. Mann was outdone by the strength of his rival after the resumption of the fight as Obata picked up four more points to emerge as a runaway winner. Mann had little time to lick his wounds as he had his second bout scheduled against Cuban Fundora who also overpowered the Indian. Fundora scored a point very early on and then grabbed two more to take a 3-0 lead at the break. Things progressed pretty much along the same lines in the second session in the one-sided contest which ended Mann’s all-too-brief campaign in the Games. “I’m really disappointed and don’t really know what happened to me. After the first attempt, I was feeling uneasy and giddy. It was very windy out there and I really don’t know what affected my performance,’’ said the jumper after finishing sixth with an attempt of 6.83m. Last night, Anju was off to a very confident start as she leapt to create a new national record. The lanky Indian , however, could not repeat or better her first jump as she followed it with an effort of 6.75m and then she totally missed her steps to foul her third attempt. In her next three attempts, the Indian recorded 6.68 and 6.61 before fouling her sixth and last jump. The Russian trio of Tatyana Lebedeva, Irina Simagina and Tatyana Kotova claimed the gold, silver and bronze in that order with jumps of 7.07m, 7.05m and 7.05m respectively. “My spikes bobbled whenever I hit the board or landed on the deck. I don’t know what happened,” said a visibly upset Anju. “I knew I was in one of the toughest fields and I tried to go all-out”, she added. Anju, however, assured her fans that she had it in her to come up with a better show. “Yes I’m upset but my best is yet to come”, she said. Big on hype and low on performance, Indian hockey team finished a deserving seventh in the Olympic Games here. The decline of Indian hockey is not a new phenomenon, nor is its humiliation but what is surprising is the bluff and bluster the officials used prior to the start of the game. The bubble burst on the very first day when Holland beat India 3-1 in the opener and immediately the blame game began. “We lost the chances, we missed sitters” was the refrain of the officials but it was not Holland’s fault if Indians could not score. The Indians made heavy weather of their 4-2 victory over South Africa and then lost to Australia 3-4 and that effectively ended their hopes for the medal. The Indians did play well against the Aussies but the end result was that they lost and lost three points too. The Indian pride was dealt another blow when New Zealand pipped them 2-1 and the former Olympic champions behaved like spoilt rich kid. Instead of accepting the defeat gracefully, they made fool of themselves by lodging and relodging the protest against a umpiring decision. Both their protests were thrown out and they not only lost 1000 euroes but also the face. Indians were lucky to have drawn with Argentina to finish fourth in the pool with one win and then met Pakistan who thrashed them 3-0 ending their hope of even the fifth position. The Asia Cup winners finally managed a 5-2 win against listless Korea to complete their highly forgettable Olympic campaign. At the end, India deserved to finish seventh. The team was in a mess from the day one and there was no discipline and cohesion among the players. The officials who till the start of the Olympics, were praising the players started finding fault in them and the players did no better. Dhanraj Pillay wrote against German coach Gerhard Rach in a newspaper column and Prabhjot Singh lambasted the coach in a television interview. The shaken Indian Hockey Federation (IHF) babudom did what it is known for. They decided to teach the players a lesson and picked up Dhanraj Pillay. The veteran of four Olympics was humiliated in the last match. He met the same fate which coach Rajinder Singh had met a month back in Germany. If Rajinder was unceremoniously sacked, Dhanraj was benched in his last Olympic match. It was a pathetic sight to see Dhanraj walking towards the bus after the match forlorn and lonely. The humiliation and the hurt was clear on his face. None of the teammates was with him and on the other end there were a few officials with glee and smile on their face. It was indeed a strange sight. The officials being happy at their own player’s humiliation after their team humilated the nation and these officials now talk of rebuilding hockey. The millions of rupees spent on the team’s physical training at Arizona and then on coaching, conditioning and competition camps in Germany and Holland went down the drain as the Indians put up a dismal display. “There were many things which led to this disaster” IHF chief KPS Gill observed when asked for the reason for the poor showing of the team but he did not divulge them. “I will tell everything when I return home” said Dhanraj after the match and two days earlier Garhard Rach had openly lambasted Prabhjot Singh saying that player was criticising him to hide his own failures. Prabhjot still played the last match full while Dhanraj went in for couple of minutes. Talk of even handed justice, IHF style. And clearly the last word on this disaster story is yet to be said. In the seven matches Indians played, barring a few occasions, they never looked like a winning combination. There was no authority in their style of play. They missed chances and held on to the ball for too long. The players to survive in this disastrous showing were Adrian D’souza, Dilip Tirkey, Harpal Singh, Viren Rasquinha, Arjun Hallapa,I gnace Tirkey and Vikram Pillay. Dhanraj Pillay and Baljit Singh Dhillon must have realised that though one can hide the age, one can not fight the age. The two veterans sparkled but very briefly. Gagan Ajit Singh, Prabhjot Singh and Deepak Thakur lived up to their reputation of poster boys coming good when it was not needed but flopping in time of crisis. Sandeep Singh has a long way to go and Devesh Chauhan stayed glued to the bench most of the time while Adam Sinclair must be wondering why and how he was there. The Australians, the eventual winners, runners up Holland, third placer Germany, Spain and Pakistan were all few notches above India. The hype that the Indian hockey is on revival mode because of their victories in last one and half years turned out to be a big hoax. The so called revival was basically Pakistan-centric. US Secretary of State Colin Powell spared Greece a security headache by abruptly cancelling a trip to Athens. Protesters said a Friday night clash with police over the US-led invasion of Iraq had scared Powell away. Argentina dominated an ill-tempered clash before 44,000 spectators at the Olympic Stadium, winning 1-0 after Carlos Tevez tucked in a Mauro Rosales cross in the 18th minute. For Paraguay, the silver was their first Olympic medal. "To be Olympic champion is a unique feeling," said Argentine coach Marcelo Bielsa. "I haven't cried yet but not crying does not mean I am not very satisfied. It's very special." Like Argentine defender Gabrial Heinze, mountain bike gold medallist Julien Absalon of France said his victory at Mount Parnitha, north of Athens, was in honour of his late father. "It's thanks to him that I'm here today and it's from him that I have got my strength — the strength to do this," Absalon said. Absalon's win finally gave the traditionally strong French cycling team something to shout about at the end of an otherwise dismal Olympics in which they had failed to top the podium in 17 previous races on road, track and mountain. Spain's delighted Jose Antonio Hermida, who took silver, said: "I look like a girl! I cry the whole time!" In the latest of a string of doping incidents, Puerto Rican wrestler Mabel Fonseca was excluded from the games after testing positive for the banned steroid stanozolol, the International Olympic Committee (IOC) said. She finished fifth in the women's 55kg freestyle class. The IOC also said it was still trying to locate Hungarian Olympic hammer champion Adrian Annus, who is suspected of having tampered with his doping sample. Annus, who won gold on Sunday, did provide a negative test after the competition, but the IOC has warned that unless he does a second test he will be stripped of his medal. Hicham El Guerrouj of Morocco and Ethiopian Kenenisa Bekele move up and down respectively from their favoured distances to converge on what could be an epic Olympic 5,000 metres clash. El Guerrouj (29) finally claimed the Olympic 1,500m title which escaped him at the 1996 Atlanta games and again in Sydney four years later. Bekele, seven years his junior, won the 10,000m gold and is now attempting to become the first Ethiopian since Miruts Yifter in 1980 to complete the long-distance double. The US women's basketball side beat Australia 74-63, outshining the US men who were embarrassingly knocked out of gold contention by Argentina a day earlier. Austrian sailors Roman Hagara and Hans Peter Steinacher retained their Olympic Tornado title in their two-man catamaran, fastest of the Olympic sailing classes. 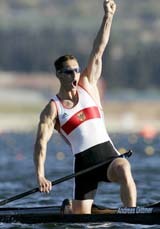 Veteran German rower Birgit Fischer, who first competed in 1980, was disappointed when she failed to win a record-equalling ninth Olympic gold medal and settled for silver. China celebrated a stunning double gold athletic triumph at the Athens Olympics with Liu Xiang equalling a world record in the men's 110m hurdles and Xing Huina winning the women's 10,000 metres. Liu equalled Colin Jackson's 11-year record of 12.91 seconds in storming to the title and was followed by Xing's triumph. The 20-year-old ran a personal best of 30 minutes 24.36 seconds yesterday to become the fourth-ever Chinese female athlete to take gold. 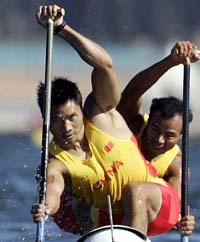 It was a wonderful boost for the prestige of Chinese sport heading to the next Olympics in Beijing in 2008. There was a sensation in the basketball with Argentina dumping the USA out in a 89-81 semifinal upset. The US team becomes the first group of NBA players not to claim Olympic gold and with three total losses, the squad has dropped one more game than all US teams combined in the previous 68 years. Russia's Tatyana Lebedeva captured the women's long jump title with a best effort of 7.07m but American triple Olympic champion Marion Jones missed out on a medal in the fifth place. There was worse to come as a botched handover involving her led to the US team crashing out of the women's 4 x 100m relay final which was won by Jamaica. It's been a horrible year for Jones, who has been subjected to allegations of drugtaking by her ex-husband CJ Hunter, while 100m world record-holder Tim Montgomery, her boyfriend and father of her one-year-old son, has been implicated in the scandal. There was more heartache for Britain's Paula Radcliffe, who again failed to finish in the women's 10,000m after flopping in the marathon. German kayaker Birgit Fischer created her own piece of Olympic folklore. Fischer, a 42-year-old mother of two, captured her ninth Olympic gold medal to become the most successful female athlete in Olympic history. She joins nine-times gold medallist Russian gymnast Larissa Latynina. Drugs again blighted the games with Russian 400m runner Anton Galkin yesterday kicked out of the Olympics for returning a positive drugs test and reports that Hungarian silver medallist weightlifter Ferenc Gyurkovics had failed a doping test. The IOC announced Galkin had tested positive for an anabolic steroid after finishing fourth in his semifinal on August 21 and he became the 21st competitor to be sanctioned for drug-related offences here. 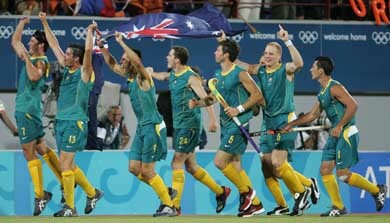 Australia's 'nearly men' finally broke through for a hockey gold medal with a golden goal in a 2-1 victory over the Netherlands in the final. The Kookaburras, as the Australian team is known, had lost three previous finals after making it to the semifinals and beyond in eight of their last nine appearances since Tokyo in 1964. World champions Germany took the bronze defeating Spain 4-3. Norway won a gold medal with Gunn-Rita Dahle's all-the-way win in the women's mountain bike and there were two taekwondo gold medals decided, Hadi Saei Bonehkohal of Iran in the men's 68kg and South Korean Jang Ji-Won in the women's under-57kg featherweight. Zsuzsanna Voros of Hungary claimed the gold in the women's modern pentathlon. Two-time defending champions the USA withstood their closest call of a 24-game Olympic win streak before advancing to the women's basketball final with a 66-62 win over Russia. Performing to the theme tune from the ''Matrix'', the Russian quintet stormed into an early lead with 25.300 points with their twirling ribbon display. Having swapped their black and silver ensembles for hot pink numbers, the Russians produced a routine full of drama and intrigue in the second rotation. With three hoops and two balls, the champions showcased their acrobatic choreography to the music from ''Kill Bill''. The crowd erupted after Italy's second routine but their chants of ''Italia Italia'' failed to sway the judges and the team ended up taking the silver with 49.450. He timed 13 minutes 14.39 seconds. The silver went to Ethiopia’s Bekele with 19-year-old world champion Eliud Kipchoge of Kenya taking bronze. Bekele, just turned 22, had been hoping to complete a historic double of his own. He won the 10,000m in Athens. Russia’s Yuriy Borzakovskiy snatched the Olympic men’s 800 metres gold medal today, timing a late surge to the line to perfection. The 23-year-old Russian, who won silver at last year’s world championships, powered past Denmark’s Wilson Kipketer and Mbulaeni Mulaudzi of South Africa in the final few strides to win in one minute 44.45 seconds. Mulaudzi out-dipped Kipketer to win silver in 1:44.61 to add to the world indoor gold he won in March. Kipketer, the three-time former world champion and world record holder, had to be content with bronze in 1:44.65. World champion Djabir Said Guerni of Algeria and Kenyan Wilfred Bungei, the fastest man in the world this year, took up the early pace but the opening lap of 51.84 seconds was not as fast as had been expected. Kipketer stamped his authority on the field 200 metres out and coming off the final bend looked set at last to win the Olympic title that has eluded him. The 31-year-old former Kenyan, world champion in 1995, 1997 and 1999, seemed to have run the kick out of the rest but he had reckoned without Borzakovskiy, the twice former European champion. Eyeballs bulging, the Russian surged outside Kipketer and powered into the lead with only a few metres to spare in a beautifully timed finish. Such was Kipketer’s shock that he forgot about Mulaudzi on his inside and the South African, third in last year’s world championships, leaned forward to sneak silver. Guerni faded badly to finish seventh. Earlier, China celebrated a stunning double gold athletic triumph at the Olympics with Liu Xiang equalling a world record in the men's 110m hurdles and Xing Huina winning the women's 10,000 metres. In a physically brutal encounter, the women of Ukraine outmuscled world champions France to take the handball bronze medal with a 21-18 win at the Athens Olympics today. ''This was sweet revenge for losing to them in the world championships,'' said Larysa Zaspa, the Ukrainian captain. The Ukrainians, making their first appearance at the Olympics, were dogged in their refusal to allow the French any space, cutting down their shooting chances. The Ukrainian methods were not always looked upon kindly by the referees. On seven occasions, as opposed to one by France, a Ukrainian was sent to the two-minute sin-bin. Olena Yatsenko and Ganna Siukalo went twice while coach Leonid Ratner was also dismissed from the bench midway through the second half for foul-mouthing the referee. There were no complaints from the Ukrainians, however, who also suffered at the hands of the officials in their semifinal defeat by Denmark. The first half was evenly contested and ended 10-10 and when Ratner got his marching orders it had moved to 15-15. That was a key period, however, as France's Leila Lejeune, who netted six times in the first half but just once in the second, missed a seven-metre penalty. With seven boxers in the finals, Cuba were dreaming of matching their seven boxing titles from the 1992 Olympics in Barcelona, a record at a non-boycotted games. But Manus Boonjumnong had other ideas. Relying on an awkward yet effective style, he frustrated the more spectacular Cuban to win a 17-11 decision. British teenage boxing sensation Amir Khan believes he can go all the way to gold, even if it takes a knockout, after punching through to the Olympic lightweight final. “There is a chance,” said the 17-year-old scrap metal dealer’s son when asked yesterday whether he could beat Cuban Mario Kindelan, arguably the world’s finest pound-for-pound amateur boxer, tomorrow. The much-hyped closing ceremony will make “all of us cry,” said Gianna Angelopoulos, President of the Athens Olympics Organising Committee (ATHOC). It will be a full moon night. The ceremony will end with cascading of 2,50,000 balloons on to the crowd in the 70,000-seat stadium. Angelopoulos is hoping that tomorrow’s closing ceremony would be memorable. The producer of the ceremony, Dimitris Papaioannou, says that the extravaganza would be a celebration that would invite the world to “eat, dance and sing with us in the Greek way”. While the tickets for the closing ceremony have been sold out, there is a big cut on special tickets given to the media to cover the event. For example, of the 40-odd Indian journalists here, the ATHOC has given India only 14 tickets. Dimitiris holds that the closing ceremony would be absolutely different from the opening ceremony. “We will invite the world to dance,” he says. While his vision for the ceremony calls for the spectators and athletes dancing together, the barriers between the grandstands and the infield would keep them segregated. The highlights of the closing ceremony would be a percussion band playing instruments made from equipment used in the track and field events. After the last medal presentation ceremony — of the marathon — the athletes would be invited to “flood in without any distinction of nationality”. Since Beijing will host the 2008 Olympic Games, an eight-minute segment would be presented by the Chinese troupe of about 200 members. Since the main stadium is being used for track and field events, the organisers are using another area for holding a dress rehearsal of the closing ceremony. The ATHOC has been claiming that after a long time, the Olympics have been held without any clichés. “There have been no organisational problems anywhere. Of course, the fight against drug cheats has been intensified, but as far organisational failures or lapses are concerned, there are hardly any,” says Angelopoulos. “We owe our success to volunteers,” she adds. The organisers claimed that they have sold more than 3.5 million tickets so far. Come August 30 and more than 80,000 athletes, officials, media personnel and others would be saying goodbye to Athens, the ancient birth place of the Olympics. To avoid over crowding and departure rush, the airport authorities have cautioned the passengers against reaching the airport more than three hours in advance of their scheduled flight. On Monday, the first busy day for departures, there would be 850 aircraft movements as 80,000 passengers are expected to depart. In Sydney, a temporary international terminal had been set up to facilitate Olympic participants. A special baggage check in counter had been set up in the Olympic village. As of now the Olympic city is looking forward to the closing ceremony. Only the higher denomination tickets, 750 Euro each, are available for the closing extravaganza. Normally, athletes participating in an event are given a complementary ticket or two for his or her family members to witness his or her event. Yesterday, Mr Sardara Singh, father of Indian relay runner, Rajwinder Kaur, was lucky to get a ticket of 40 Euro without paying any premium. “While I was looking for a ticket to enter the stadium, I met a woman who wanted to sell her ticket,” reveals Mr Sardara Singh. The Indian quartet had set a new national record while qualifying for the final of the event. “I do not know whether I will be second time lucky to see the final featuring my daughter. All tickets have been sold out,” rues Mr Sardara Singh, who came all the way from Sabhra village in Patti tehsil of Amritsar district, to see his daughter run. “Miresmaeili’s act was extremely valuable, and therefore we are awarding him the gold medalist award,” the head of the Iranian Physical Education Organisation, Mohsen Mehralizadeh, was quoted as saying in the official daily Iran. Asked to chase 193 on a deteriorating wicket, Pakistan seemed well on course at 154 for 5 in the 42nd over before the critical stand between Yousuf Youhana (43) and Abdur Razzaq (26) was broken and Australia tightened the screws around them. Earlier, Australia put up a gutsy performance on a difficult batting track to make 192 for seven. FoW: 1-21, 2-65, 3-126, 4-183, 5-189, 6-192, 7-192. Bowling: Sami 10-1-26-1; Ahmed 8-1-25-1; Shoib 10-0-40-3; Razzaq 8-1-30-1; Afridi 6-0-20-0; Malik 8-0-45-0. FoW: 1-24, 2-47, 3-65, 4-93, 5-93, 6-154, 7-161, 8-171, 9-175. Sangakkara scored an unbeaten 74 and Gunawardene 52 as Sri Lanka surpassed South Africa's total of 235 for seven with 23 balls to spare for a 4-0 lead in the five-match series. FoW: 1-47, 2-61, 3-113, 4-115, 5-115, 6-179,7-195. Bowling: Malinga 5-0-40-0, Fernando 5-0-28-1, Maharoof 6-0-20-1, Dilshan 6-0-44-1, Jayantha 1-0-7-0, Jayasuriya 10-2-24-0, Lokuarachchi 10-0-39-2, Chandana 7-0-30-1. The Indian cricket team left the Dutch Capital for England a day ahead of schedule today, wanting to get better practice ahead of its three-match Natwest Challenge series against the home side and the ICC Champions Trophy. India, which plays its first game against England at Trent Bridge on September 1, was slated to leave Amsterdam tomorrow after the conclusion of the Videocon Cup tournament here. However, since the side has not been able to get a decent practice session in the rain-drenched Netherlands, it revised its travel plans. The first couple of training sessions in Trent Bridge will be critical for the team to assess the availability of master batsman Sachin Tendulkar, who was ruled out of the Videocon Cup tournament with a tennis elbow. Arush Bhandari of Spring Dales School, New Delhi, today won gold medals in the under-16 boys 200m butterfly and 200m backstroke on the third day of the CBSE North Zone (I and II) schools swimming meet at Nehru Stadium. Students of Delhi schools won five gold medals while students from schools of Chandigarh, Punjab and Haryana won two gold medals each out of 11 events under various categories held here today. In the under-19 boys 200m butterfly, Chirag Fihloke of Spring Dales School, New Delhi, won the gold. In the under-16 girls 200m butterfly, Yashi Darbar of Birla Vidya Niketan, New Delhi, was the winner. In the under-10 girls 50m butterfly, Kamya Thukral of Mont Fort School, Delhi, won the gold medal. In the under-19 boys 200m backstroke, Abhimanu Tiwari of Bhavan Vidyalaya, Chandigarh, won the gold medal. In the under-14 girls 100m butterfly, Harsimran Kaur of Shivalik Public School, Chandigarh, was the winner. In the under-16 girls 200m backstroke, Sanjeevan K.Brar of Gen Gurnam Singh Public School, Sangrur, won the gold medal. In the under-19 girls 100m freestyle, Bavneet Kaur of SPS, Ropar, was the winner. In the under-14 boys 50m breaststroke, Malook of Shah Satnam Ji, Sirsa, won the gold medal. In the under-19 50m breast stroke, Ankur of the same school was the winner.